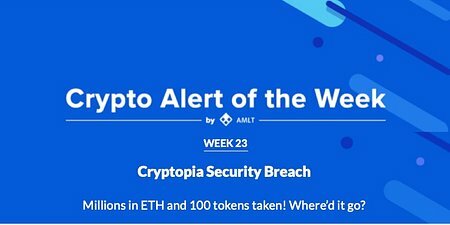 Welcome to week 23 of the Crypto Alert of the Week series by AMLT, a series dedicated to documenting interesting or high profile frauds/hacks etc that recently happened and have been reported into the AMLT Network and show how the AMLT Network along with the Coinfirm AML Platform can help fight and prevent it in the future. A major New Zealand Cryptocurrency Exchange with over 2M users (source), Cryptopia, announced an unscheduled maintenance on the 13th of January which caused a problem that their users could not log in, deposit or withdraw cryptocurrency assets. 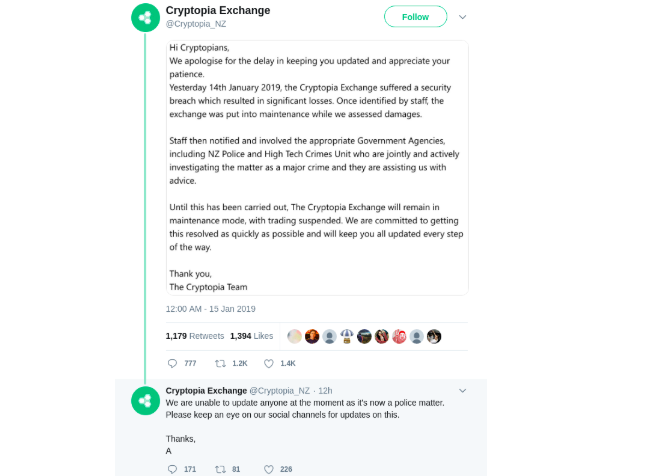 An official statement has been issued by Cryptopia 13 hours later where stated that they suffered a security breach which caused significant losses. 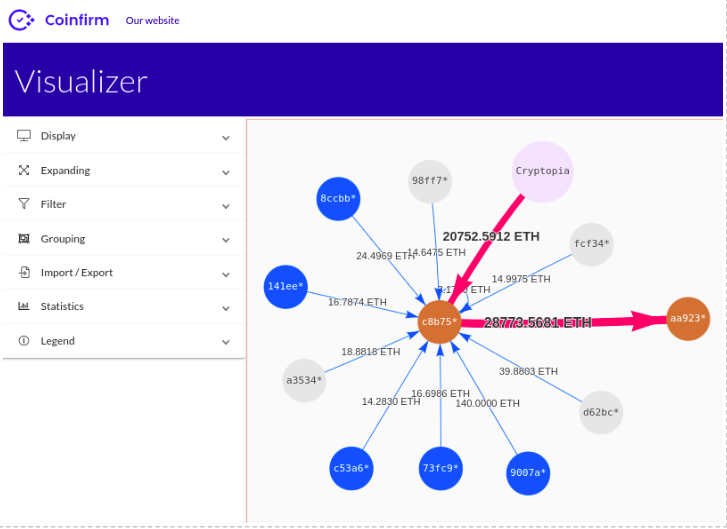 According to the statement above we could assume that they got hacked and lost over 28773.56 ETH which was worth approximately $3.63M at the time of transaction. Stolen coins were sent to this address 0xc8b759860149542a98a3eb57c14aadf59d6d89b9 and they were transferred further to this address: 0xaa923cd02364bb8a4c3d6f894178d2e12231655c. This was the first part of the attack, the second one includes tokens stored on Cryptopia’s Hot Wallet. 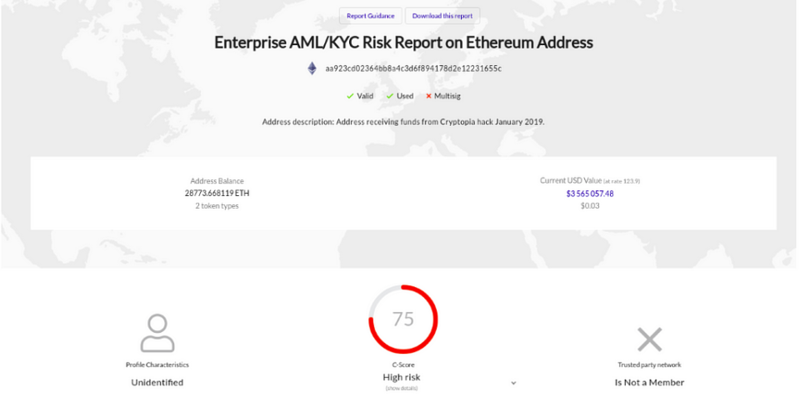 Coinfirm has analysed this address: 0x9007a0421145b06a0345d55a8c0f0327f62a2224 and it looks like 100 different tokens were stolen resulting in a loss of approx. $13.81M. The final amount totalled at: $17.44M which is the highest reported loss in 2019 so far. 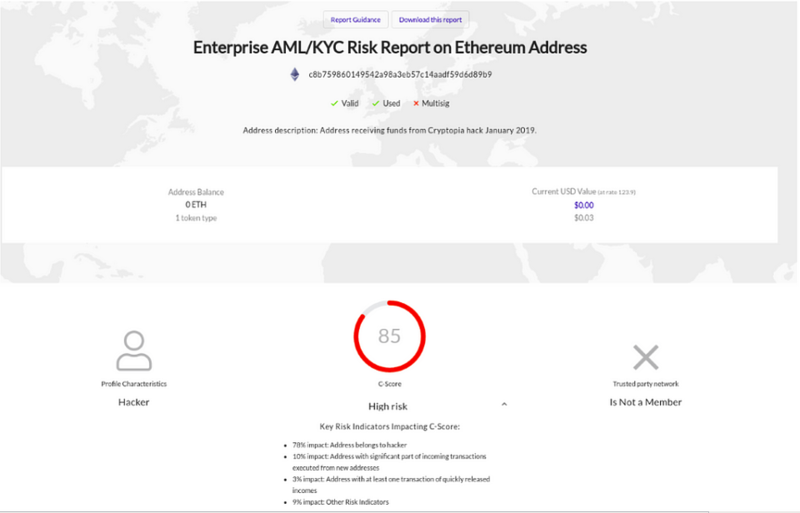 Please see our AML reports and note that interacting with these 3 addresses may expose you to risk and end up with an increased C-Score. AML Risk Report of "0x9007a0421145b06a0345d55a8c0f0327f62a2224"
AML Risk Report of "0xaa923cd02364bb8a4c3d6f894178d2e12231655c"
AML Risk Report of "0xc8b759860149542a98a3eb57c14aadf59d6d89b9"
According to Cryptopia, no further announcements will be made, please stay tuned we will give you heads up once further information by them is released.